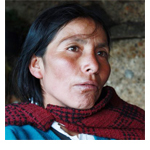 Máxima Acuña, a mother of four in the northern Andes of Peru who was never able to learn to read or write, won a lawsuit against the Yanacocha mining company, South America’s leading gold producer. In spite of this, the company has continued its violent intimidation against her. So far in 2015, Máxima has been threatened at least twice by police and agents for Securitas, Yanacocha’s private security firm, entered her property. On February 12, a World Day of Solidarity with Máxima was held.